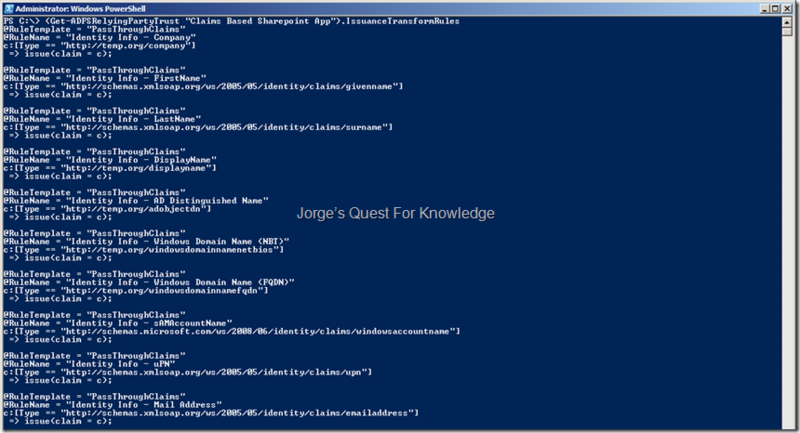 Sharepoint Server « Jorge's Quest For Knowledge! From time to time I fully update my test/demo environment to make sure all the installed stuff uses the latest available features for those versions. And yes, I’m still running some old versions because I need the basic functionality for some things to work and do not need the latest and greatest. Because I’m still running everything on a server on-premises, yes those people still exist, I need to careful will the latest and greatest apps behaving as resource hogs. And that’s why I’m still running Sharepoint Foundation 2013. At the same time while updating I some times also try out stuff just to see if things are still working. This blog is basically more about archiving this piece of information from my brain the next time it happens so I do not forget it. This time, even as a Site Collection administrator, I was not able to navigate to the site or assign permissions to some AD group or user. In the first case, I saw the error “Sorry, You Don’t Have Access To This Page”. For me that was quite surprising as by default Site Collection admin have Full Control. I googled around and noticed I was not the only one having this issue. After trying a number of solutions, the only solution that really worked for me was extending the web application and when done unextending it again. …and if correct you should now be able to resolve security principals from AD. After confirming, it is working again, you can UNextend the web application again. You should be good now. At least I was! This posting is provided "AS IS" with no warranties and confers no rights! Always evaluate/test everything yourself first before using/implementing this in production! This is today’s opinion/technology, it might be different tomorrow and will definitely be different in 10 years! 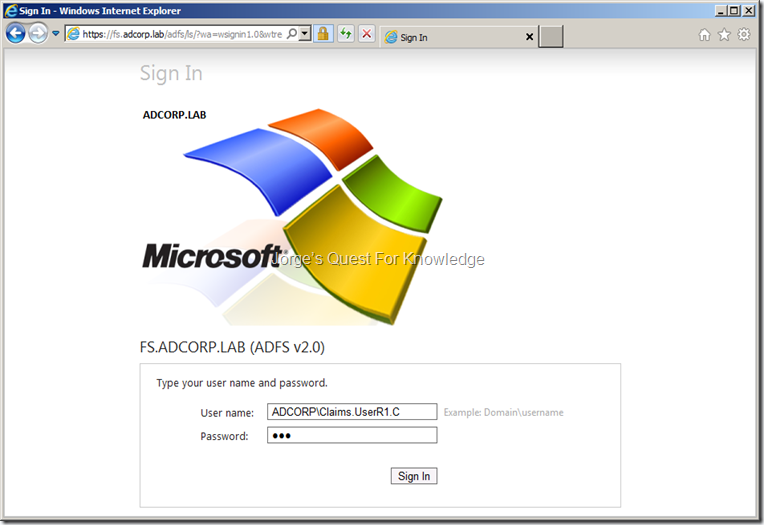 Now I’m going to log on with the user “ADCORP\Claims.UserR1.C” which has been configured with the role “ROLE_adcorp.app.ADFSAppClaimsContributor” through the group membership of a group called “GRP_R1_ADCORP-ADFS-Claims-App-Contributors”. So ADFS extracts, the user’s group memberships and tranforms the group “GRP_R1_ADCORP-ADFS-Claims-App-Contributors” into a role “ROLE_adcorp.app.ADFSAppClaimsContributor” along the way. So, let’s have a look at this! 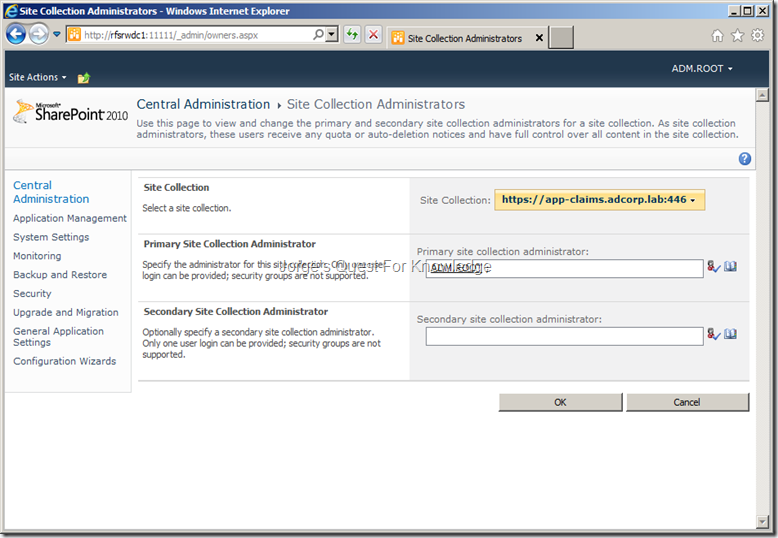 At this point everything is in place for at least the primary site collection administrator to be able to logon against the SP2010 claims based web application. 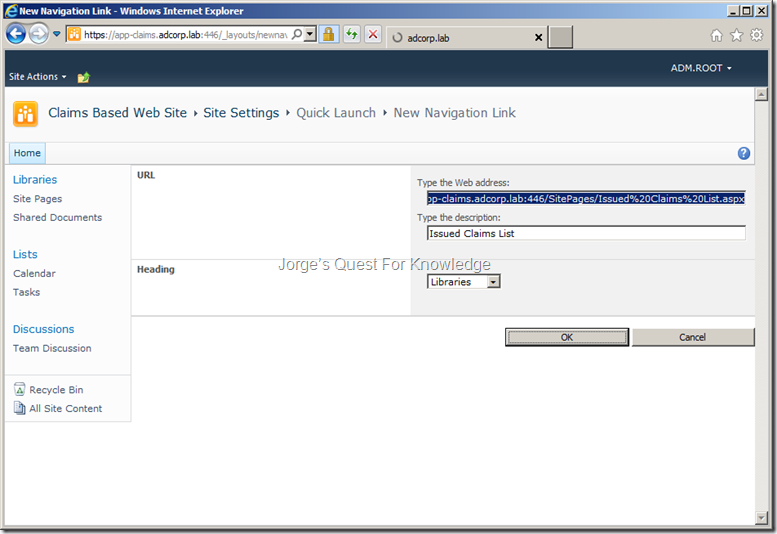 This way I’m able to configure roles within the SP2010 claims based web application to use roles to assign permissions. 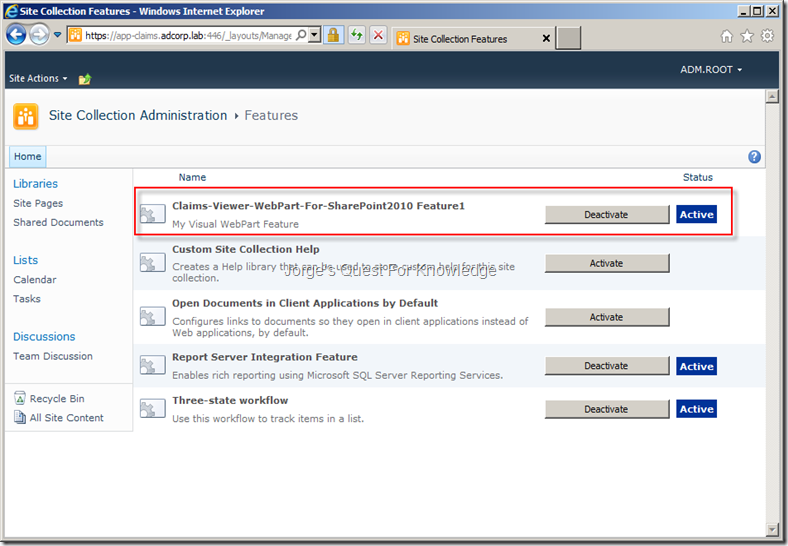 This allows other (federated) users to access the SP2010 web application based upon their assigned role. 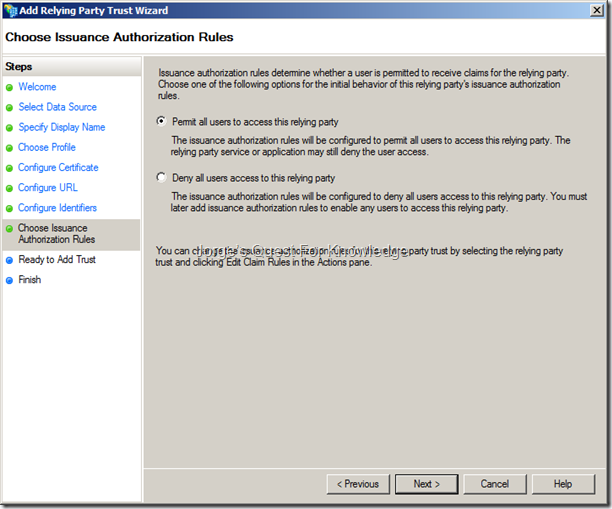 SP2010 knows of three permissions and for each permission I have configured a role. If you have the role, you also get the corresponding permission. 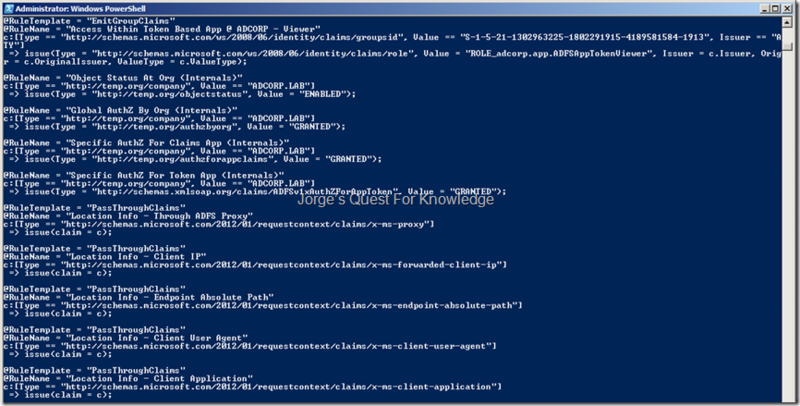 So, now lets configure these roles and corresponding permissions within the SP2010 web application. Repeat these steps for every role that needs to be configured and assign the correct permissions as also stated above. At this point, right after the creation of the RP trust, no issuance transform rules exist and also no delegation authorization rules exist. However, one claim rule exists in the issuance authorization rules and that is whatever you selected (“Permit All” or “Deny All”) previously during the creation of the RP trust. 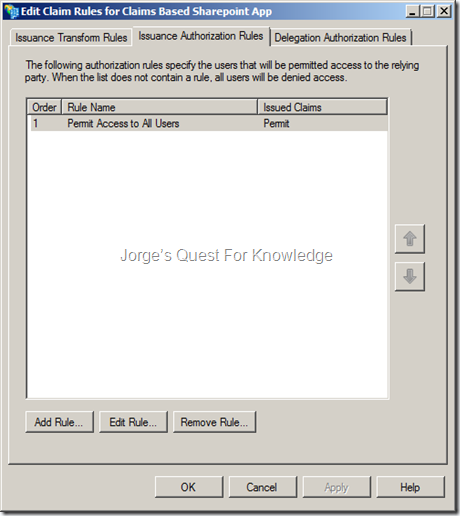 Under the hood the configuration of each claim rules is shown below. 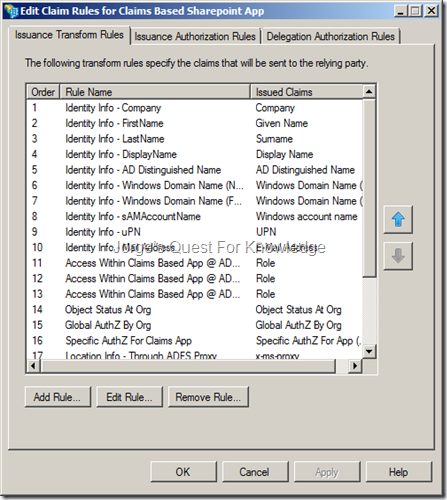 Using a PowerShell script I imported my own defined list of issuance transform rules for the “Claims Based Sharepoint App” Relying Party Trust. The total list now looks like is shown below. 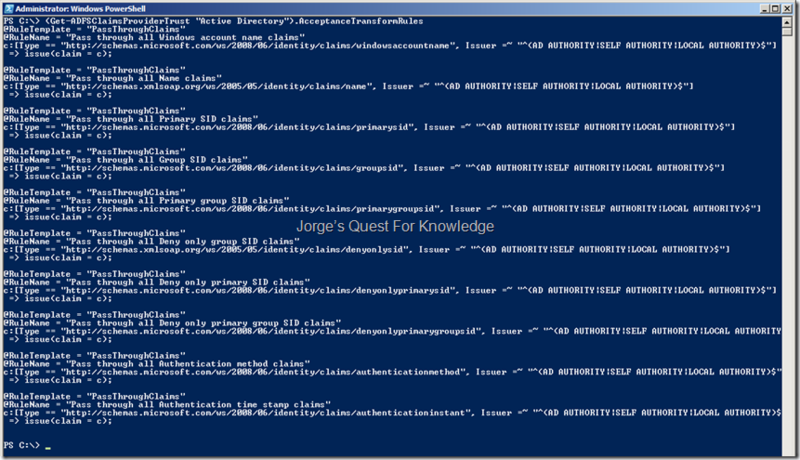 Using a PowerShell script I imported my own defined list of issuance authorization rules for the “Claims Based Sharepoint App” Relying Party Trust. The total list now looks like is shown below. 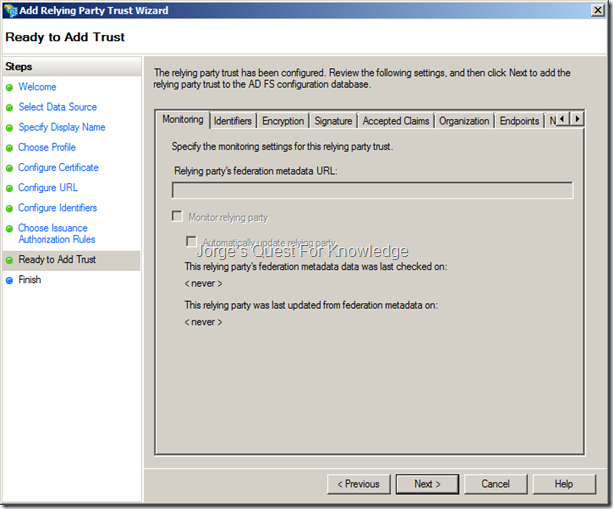 Now we need to create a relying party trust for the SP2010 web application and configure that accordingly! 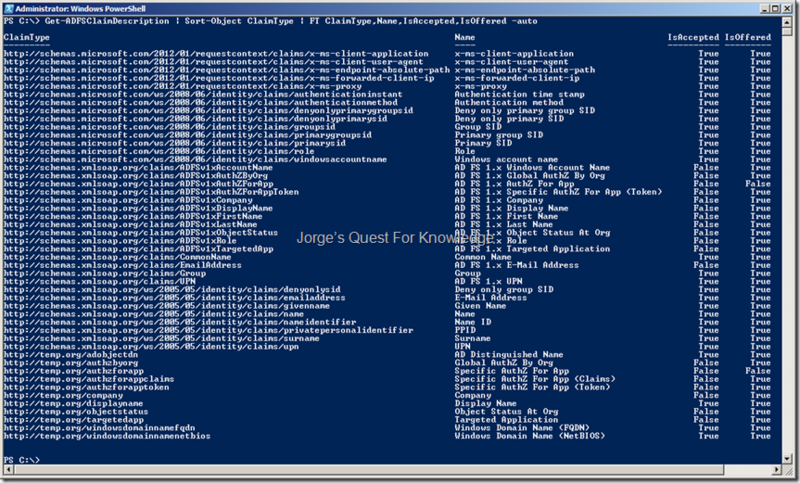 You can do that through the GUI or through PowerShell. I’m going to create the RP trust through the GUI and the configure it (issuing transform rules and authorization transform rules) through PowerShell. Start the ADFS v2.0 MMC and navigate to the “AD FS 2.0\Trust Relationships\Relying Party Trusts” node. Right-click it and select the “Add Relying Party Trust…” option. The connection to the SP2010 is already secured by SSL and therefore the security token, which is transmitted over the same connection, will also be secured by that! So, it is not needed to additionally encryption the security token itself. I honestly do not know if SP2010 supports this or not. If SP2010 would support this and you would want to enable it, you would need to provide the public part of the token decryption from SP2010. When encrypted, SP2010 would use its private key to decrypt the encrypted security token. In addition, after creating this RP trust, we also need to force ADFS not to encrypt the security token when using this RP trust. So in this case, just click on “Next >”. 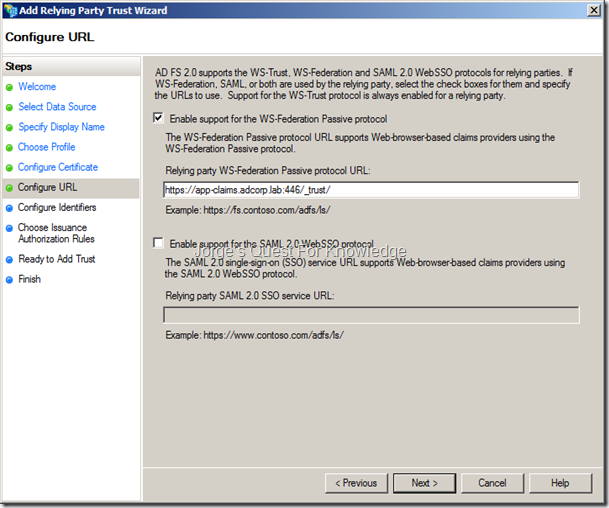 Select the option “Enable support for the WS-Federation Passive Protocol” and specify the exact same URL as when the web application was created in SP2010 and add the _trust part to it. So, in total the URL should something like “https://app-claims.adcorp.lab:446/_trust/” (without the quotes). Add the identifier, click "on “Add” and click on “Next >”. By default you can only configure “Permit All” or “Deny All”. After the creation of the RP trust you can configure all kinds of complicated conditions if you want to!. For now select the option “Permit all users to access this relying party” and click on “Next >”. This page lists through the different tabs the configured options. Review them all and after that click on “Next >”. 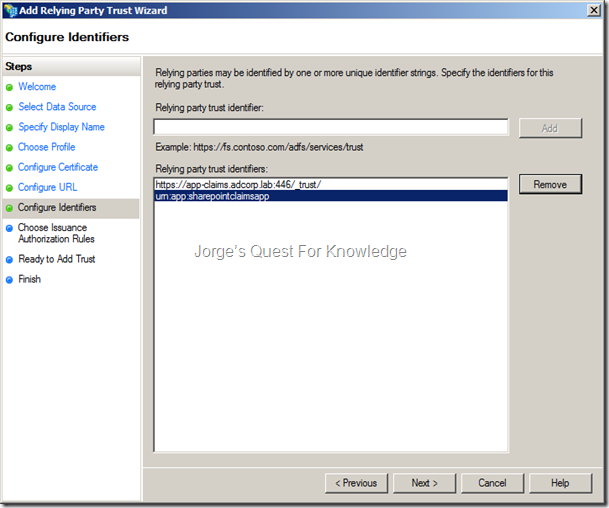 By default the option “Open the Edit Claim Rules dialog for this relying party trust when the wizard closes” is selected. 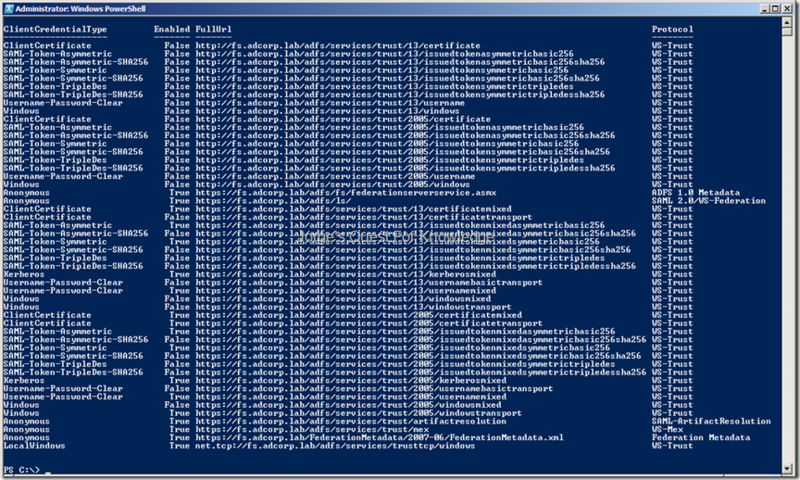 At this time UNcheck it as we will further configure the RP trust through PowerShell. 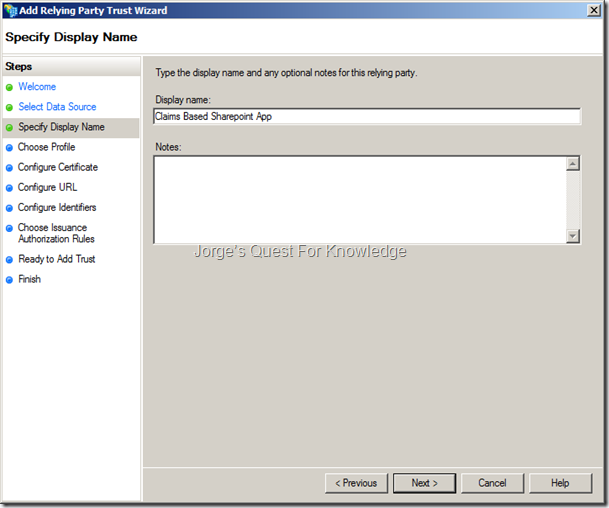 Get-ADFSRelyingPartyTrust "Claims Based Sharepoint App"
First, we are going to disable security token encryption on the RP trust “Claims Based Sharepoint App”. For information about how to install ADFS v2.0 see the blog post about Installing And Configuring ADFS v2 As An STS Server (part1, part 2, part 3) and about Installing And Configuring ADFS v2 As A PRX Server. 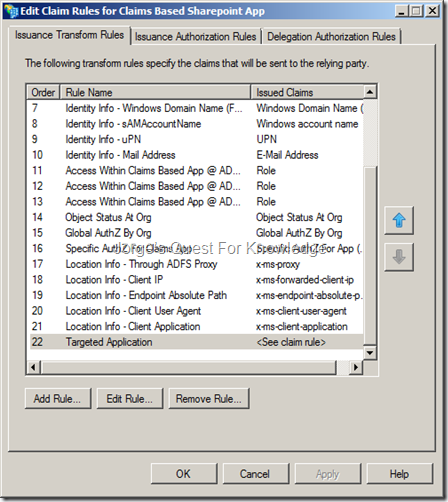 Using a PowerShell script I imported my own defined list of claims rules for the “Active Directory” Claims Provider Trust. The total list now looks like is shown below. For a demo environment it is not needed to do . 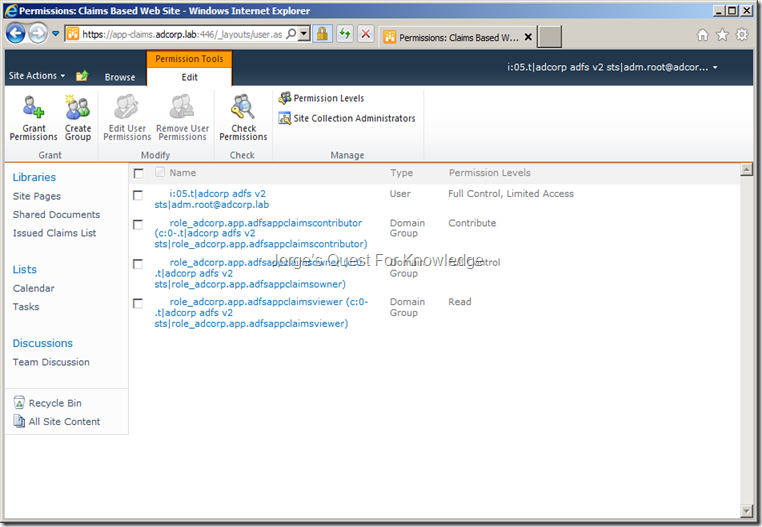 However, in whatever environment you are using ADFS you most likely need/must configure ,  and . Endpoints can be configured manually through the ADFS v2.0 MMC or through PowerShell using the Get-ADFSEndpoint and Set-ADFSEndpoint CMDlets. 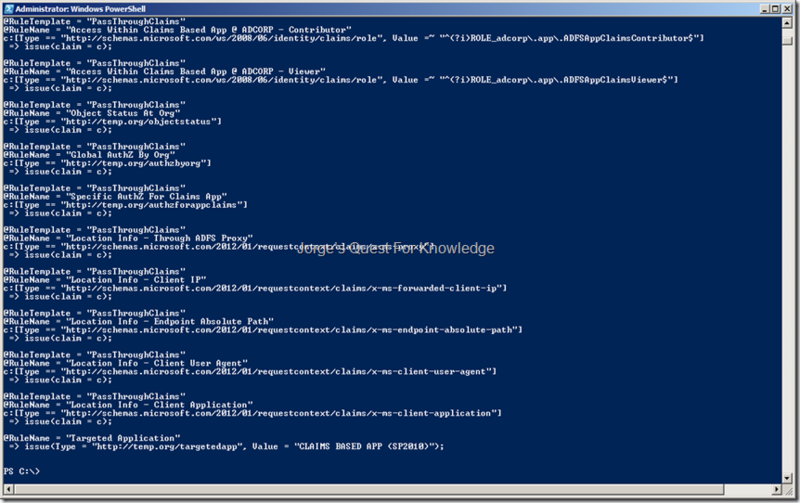 Claims Descriptions can be configured manually through the ADFS v2.0 MMC or through PowerShell using the Get-ADFSClaimDescription, Add-ADFSClaimDescription and Set-ADFSClaimDescription CMDlets. 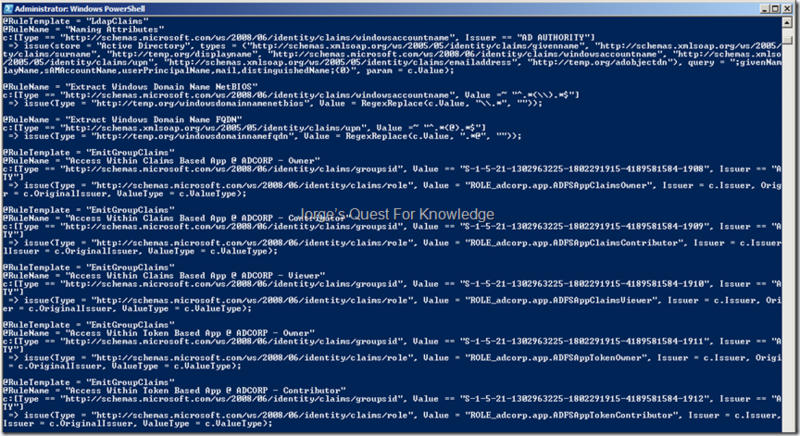 Using a PowerShell script I imported my own defined list of claims descriptions. The total list now looks like is shown below. 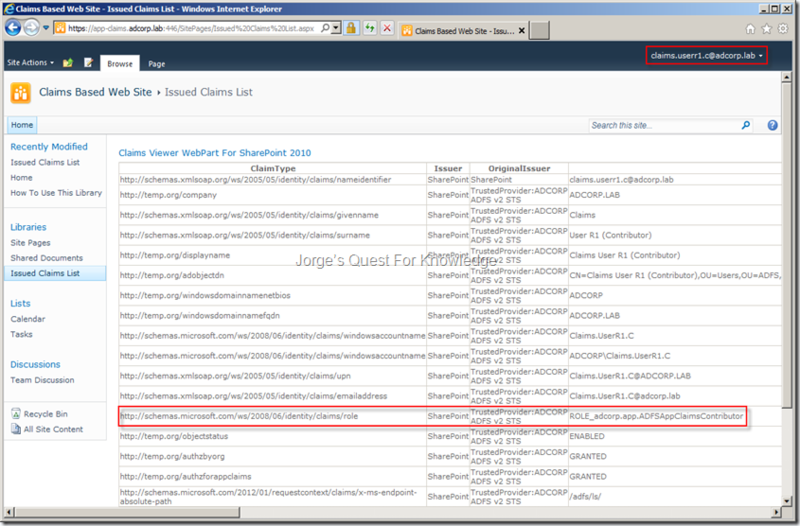 Now, we can deploy the webpart that will show us the issued claims within the SP2010 Web Application. The output of that all can be seen in the picture below. 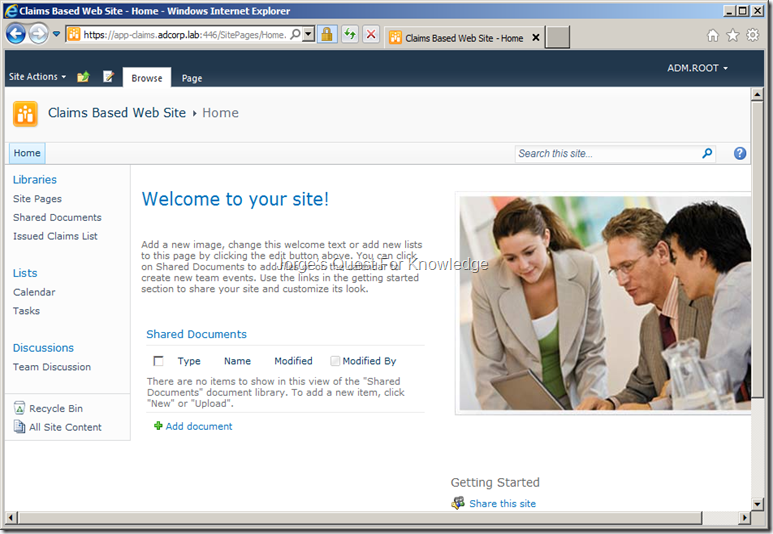 For more information about deploying/removing a solution package in SharePoint 2010, see: SharePoint 2010 Cookbook: How to Deploy or Remove a Solution Package Using PowerShell Commands and Installing or Uninstalling Features. If you are removing a solution in addition navigate to “http://<site FQDN>/_catalogs/wp/” (https://app-claims.adcorp.lab:446/_catalogs/wp/) and delete the remaining component of the web part (only the one matching the name you removed previously). 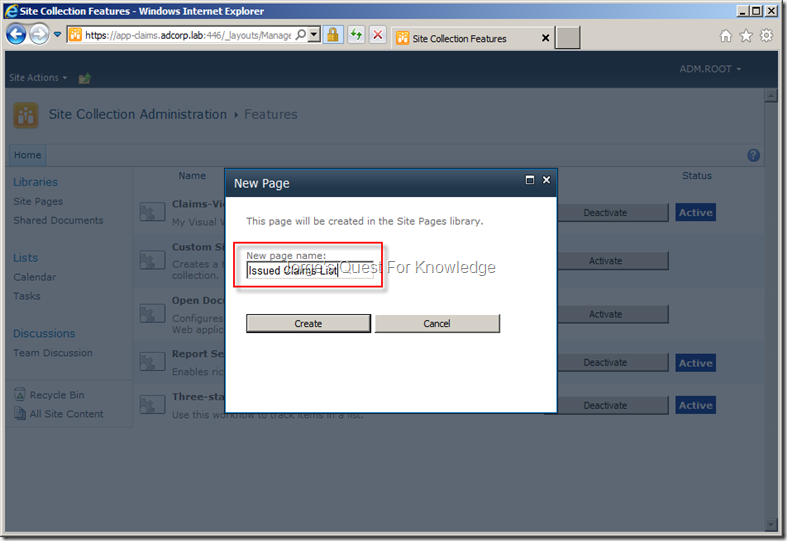 If you do not perform this step, the webpart will still be listed in Sharepoint webpart gallery, but you cannot use it! You should now see web page under the Libraries section. 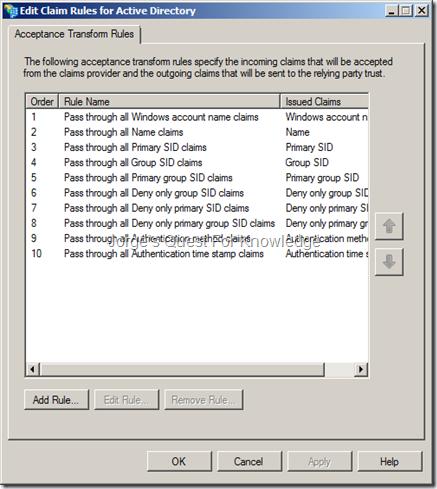 Now you may think….”Why is SP2010 using claims while we are using a Windows based account/ID?” The reason for that is that SP2010 internally works with claims, no matter what! If you look at the OriginalIssuer column you will see for a lot of the claims “Windows” as that is where the information originated from! We now need to reconfigure the web application to use the previuosly configured ADFS authentication provider. To be able to log on to the Web Application now it is also important to temporarily change the site collection administration to a federated claims ID instead of the temporarily configured Windows AD account/ID. 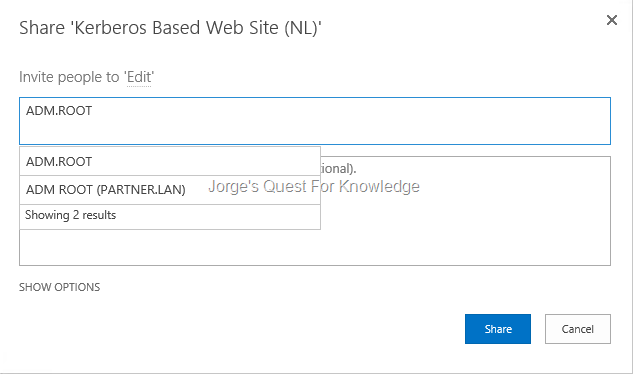 The federation related part of sharepoint is done! Let’s now create the Web Application/Site. First I’m going to collect the credentials of the AD user account that will be used by the application as the applicationpool account , then I’m going to create a managed account in SP2010 based upon the previously mentioned AD user account, which by the way must be enabled, and finally I will specify the URL and port port for the Web Application/Site. $account1 = $ENV:USERDOMAIN + "\SVC_R1_WebAppClaims1"
$webapp1 = New-SPWebApplication -name "Claims Based Web Application" -SecureSocketsLayer -ApplicationPool "Sharepoint App Claims Based" -ApplicationPoolAccount $account1 -Url $webappurl1 -Port $port1 -AuthenticationProvider $AuthNProvider1 -DatabaseName "SharePoint_WebAppClaimsBased"
$claim1 = New-SPClaimsPrincipal -TrustedIdentityTokenIssuer $AuthNProvider1 -Identity "$ENV:USERNAME@$ENV:USERDNSDOMAIN"
$site1 = New-SPSite $webappurl1':'$port1 -Name "Claims Based Web Site" -OwnerAlias $claim1.ToEncodedString() -template "STS#0"
Now let’s configure the correct SPN on the AD user account used within the Application Pool for the previously created Web Application. 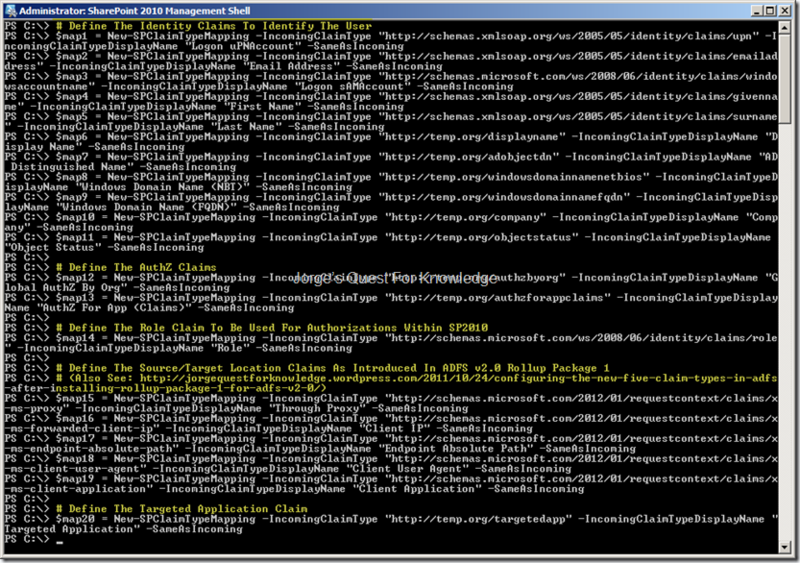 Before starting to go crazy and throw claims against SP2010 we still need to configure other stuff. 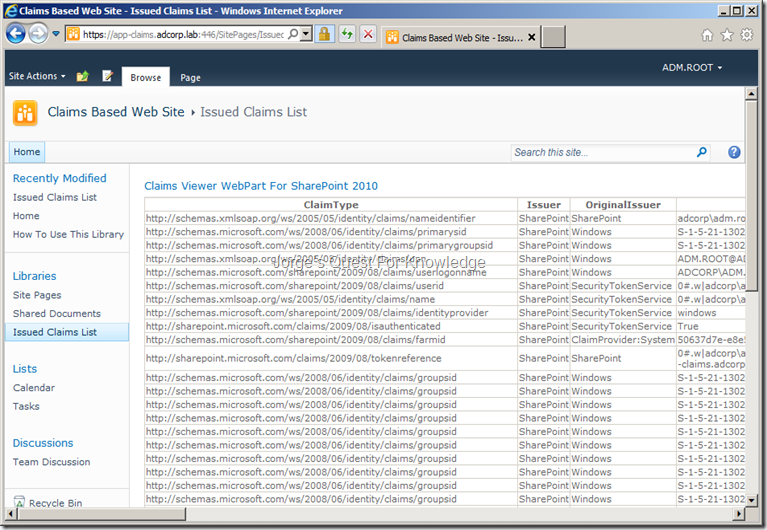 To see which claims SP2010 has accepted/used I want to deploy a webpart into SP2010 for my Claims Based Web Application. 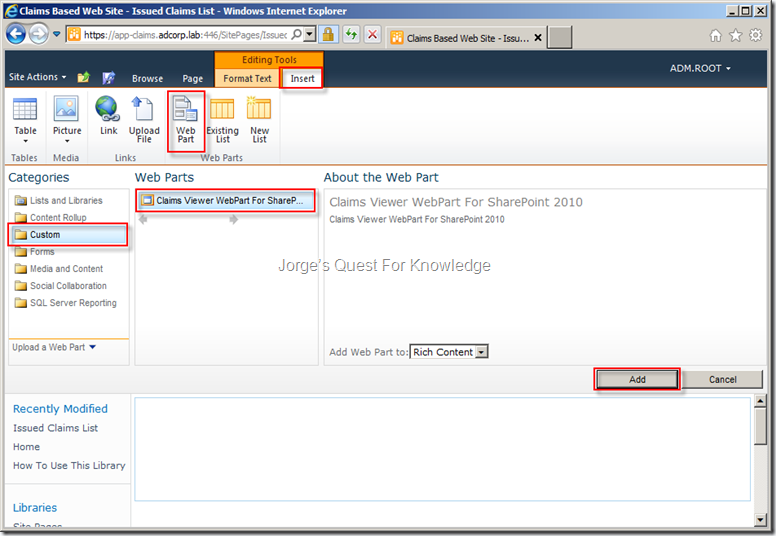 The webpart I’m using is based upon the following blog post: How To Create a Claims Viewer Web Part for SharePoint 2010. However, at this point ADFS is still not configured, so I cannot authenticate against the SP 2010 Web Application using claims to deploy the webpart. 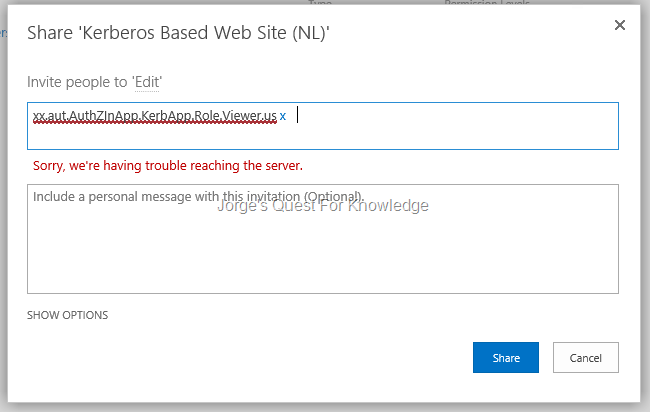 Because of that I’m going to reconfigure the web application to temporarily accept Windows Based Authentication leveraging the Kerberos protocol. 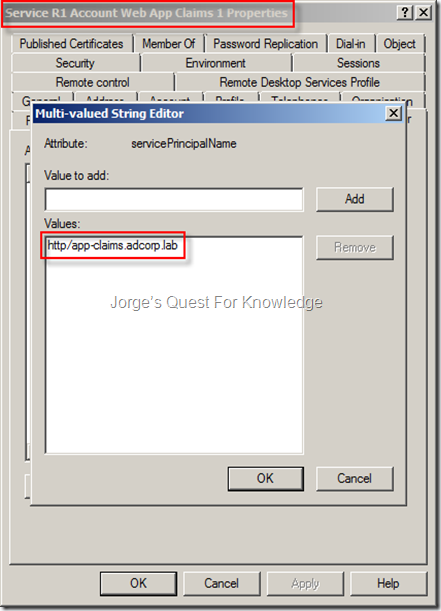 To be able to log on to the Web Application it is also important to temporarily change the site collection administration to a Windows AD account instead of the configured claims ID. 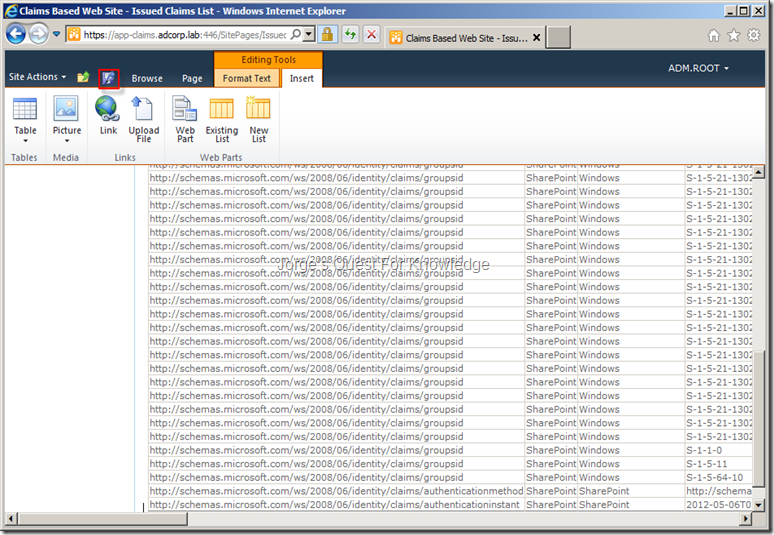 Now I’m going to define the claims within SP2010 that the trusted ADFS STS is able to issue for SP2010. 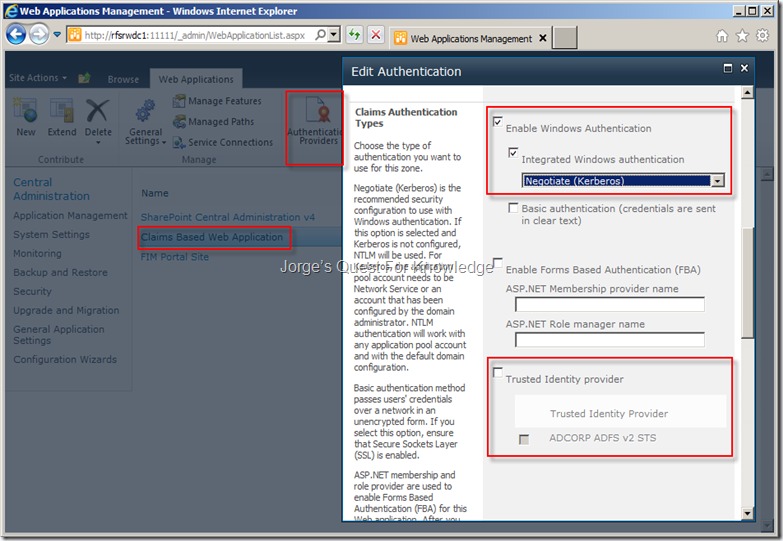 SP2010 will be made aware of these claims when creating the authentication provider within SP2010 later on. By the way, the claims shown as specific to my environment and most likely may not, or even are not, used within your own environment. 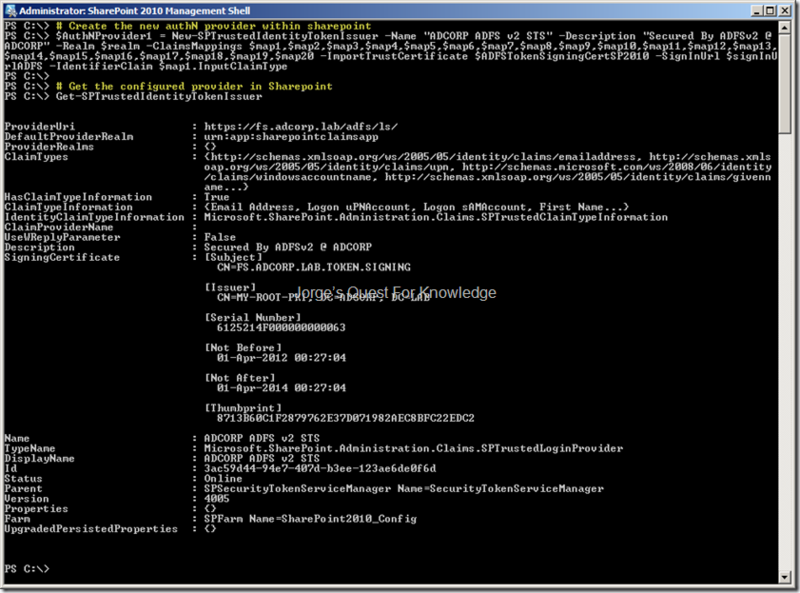 Before continuing with the PowerShell code below, make sure to start the Sharepoint Management Shell first. 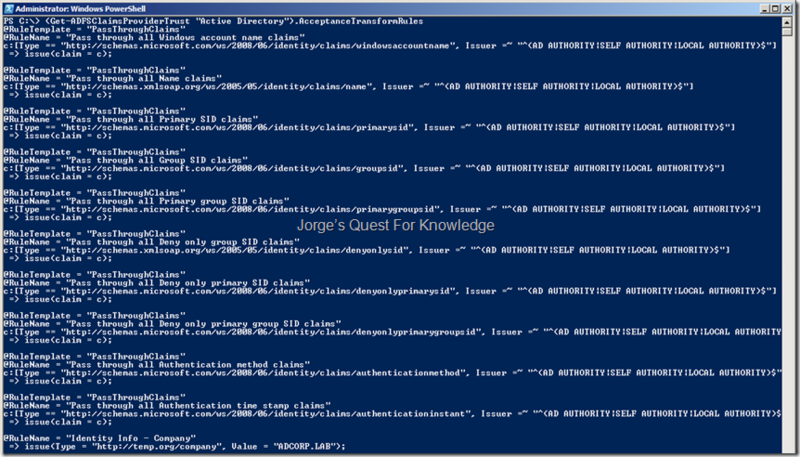 Now I’m going to define the federation service identifier (realm) that defines the application within both SP 2010 and ADFS v2.0 and finally I will define the sign-in URL within ADFS v2.0. 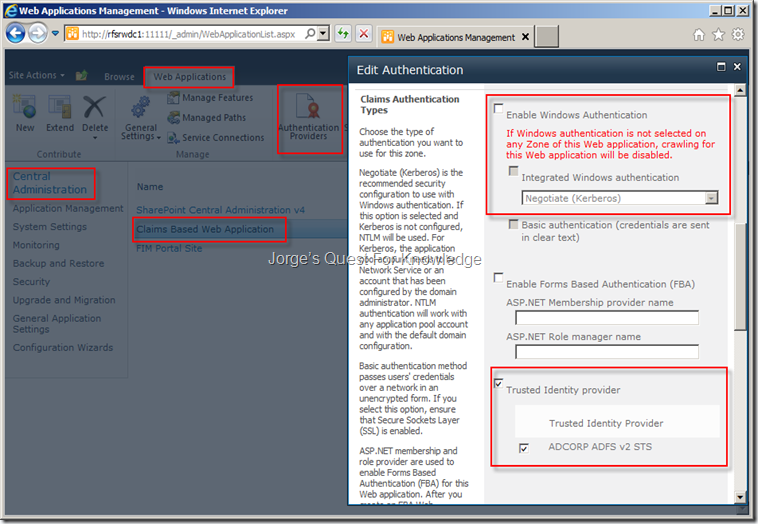 SP2010 will be made aware of these claims when creating the authentication provider within SP2010 later on. By the way, federation service identifier is case-sensitive, so do not shoot yourself in the foot by making it complicated. Choose either case and use that. If you need to specify the same name in multiple locations and you use different cases, then you will be troubleshooting after that, because it will not work. I have learned myself to use lower-case. 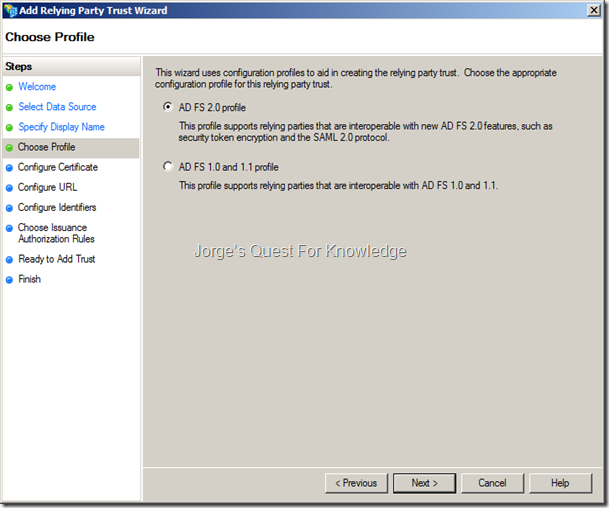 Now with all that information it is time to define the trusted authentication provider within SP2010.